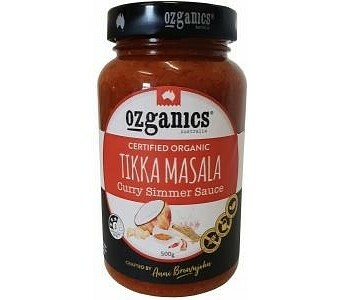 Ozganics use only the freshest coconut, coriander and other spices in their Tikka Masala sauce for a fantastically vibrant flavour. Be warned, they also use a little bit of chilli – but if you can take the heat, you’ll love the taste! Ingredients: Filtered water, certified organic tomato, certified organic onion, certified organic sunflower oil, certified organic tomato concentrate, certified organic raw sugar, certified organic herbs & spices, certified organic coconut, sea salt, corn starch, certified organic garlic, acetic acid (naturally fermented), certified organic chilli.